This page is about the British medium tank Sherman II. For the British tank with a similar name, see Sherman Firefly. The Sherman II is a Rank II British medium tank with a battle rating of 3.7 (AB/RB/SB). It was introduced in Update 1.65 "Way of the Samurai". The Sherman II is the designation of the American M4A1 Sherman and is fitted with a 75 mm gun with access to APCR ammunition. 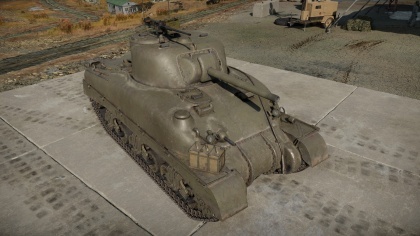 The Sherman II is basically a M4A1 Sherman, to which users of it in the American ground forces tree will be very familiar with. Almost everything with it is identical with the American version, however the Sherman II has access to the T45 APCR ammunition. This tank play style is one maximizing the -12° gun depression in hull-down positions and its very good automotive performances to travel with blistering speed on the battlefield to attack the enemy from a place they wouldn't expect. Sand skirts on the suspension sides are 4 mm thick. The best use of the Sherman II is in a defense or an exploitation movement. In the defense: hull-down position. Find a terrain like a hill where the Sherman can inch forward, exposing only the turret, yet be able to aim down most of the horizon with the 75 mm gun. 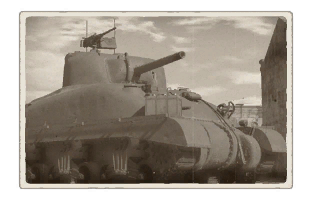 This allows the Sherman to use the most of the turret and gun mantlet armour as well as minimizing the amount of the body able to be hit by incoming enemy fire while dishing out quite a considerable amount of fire towards the enemy with a fast-firing 75 mm gun. If enemy fire at the hull-down position intensify or wound the crew members, simply reversing can put the Sherman in adequate cover and reposition for another attempt to attack the enemy. In exploitation, attack enemy utilizing the Sherman's adequate speed and handling. Maneuver into enemy territory scanning for targets. A benefit of the fast reloads and the traverse rate of the Sherman is that it allows for quick reaction to enemies spotted at various directions. Remember that in general rule of tank combat, the first person to shoot generally wins the battle. As such, it is imperative for the success of this tactic to attack an enemy not aware of the Sherman's presence and movement. 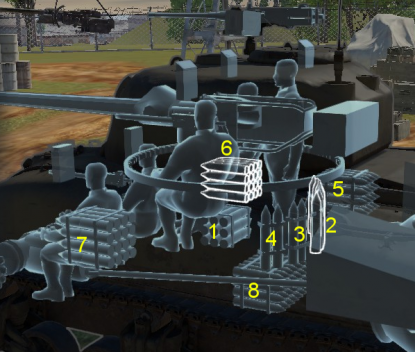 As such, an unaware enemy will probably be exposing their weak points such as the side armour, allowing for a well-placed 75 mm shot to damage the interior. Try not to be caught up in one position as being stuck in one place will cause the enemy to eventually swarm the Sherman and destroy it. Turret is well armoured from the front. Works well in Hull down positions. Faces some very strong opponents in up-tiered matches. Weak side armour. It is flat and can be penetrated by German and Russian SPAA. During the M3's development, the designs of the 75 mm armed vehicle were being drawn up and submitted by the Ordnance Department. Specifications on the tank design were strict in order to maximize logistical support. Restrictions were made on the tank's height, width, and weight in order to make it able to be transported over bridges, roads, railroads, and on naval ships. These specifications would help the Army by making the tank be very flexible on strategic, logistical, and tactical grounds. On April 1941, the Armored Force Board chose the simplest of the designs, which was a redesigned M3 hull and chassis with a turret mounting the 75 mm gun designated the T6, completed in September 1941. This tank would then designated the Medium Tank M4 in American service. The tank would eventually become the most used Allied tank during World War II as it was lended out by the thousands in the Lend-Lease program to the Allied countries. The British called the M4 the "Sherman", which coined into the tank's name M4 Sherman that it would be known as in history. The production for the Shermans began on October 1941 and would continue to be produced until the end of the war in 1945 with around 50,000 units produced, making it the second most-produced tank in World War II before the T-34 tank. The M4A1 Sherman model (known in British nomenclature as the Sherman II) ran on a gasoline Continental R975C-1 radial engine and was one of the first models of the Sherman developed. The model in-game features the early M38 telecopic sight in the M4 periscope with no zoom, which was later replaced with a M55 telescopic sight in the gun mantlet by recommendation from the British. The tank's hull was fully cast, giving the tank a distinctive rounded slope front and sides. Though the rounded shape gave the frontal armour uneven angling, it provided adequate protection up to 100 mm in thickness in certain areas. Cast armour was used because casting took less man hours to perform, but suffered from the limited capability of most American factories and was hard to repair on the field. Thus, welding was prioritized as the primary manufacturing method in the other Sherman variants. Nevertheless, up to 6,281 M4A1s were produced from February 1942 to December 1943, out of the 49,234 Sherman units produced in the war. Past these designation, there would be a letter to signify differences in model design. A designation ending with "A" indicates the usage of the 76 mm gun. A designation ending with "B" indicates the usage of the 105 mm howitzer. A designation ending with "Y" would indicate the usage of the Horizontal Volute Suspension System (HVSS). Finally, a designation ending with "C" indicates the usage of the 17-pdr gun, essentially translating to the Firefly. There was a word addition "Hybrid" exclusive to the Sherman I variant, meaning the M4 Hybrid design which used a cast front armour, but a welded rear design. M4A1 - American equivalent of the Sherman II. A1E1 Independent - The only other tank in the British tech tree with AP-HE ammunition.